Matt Smith returns as the Eleventh Doctor in thirteen blockbuster episodes plus two specials, each a brand new epic adventure with new monsters and familiar foes like you’ve never seen them before. In The Doctor, The Widow and The Wardrobe, a madcap caretaker greets evacuee Madge Arwell and her two children and leads them into a magical wintry world. Then, the first part of series seven sees the Ponds (Karen Gillan and Arthur Darvill) in their final voyage with The Doctor. They save a spaceship full of dinosaurs, don Stetsons in the Wild West and are even kidnapped by The Doctor’s oldest foe. But when they arrive in Manhattan the Weeping Angels are waiting for them. Christmas brings The Doctor a new friend (Jenna-Louise Coleman) but how, where, and when will he meet her? And the final eight episodes see The Doctor and his new companion battle monsters on distant alien planets, become trapped in a Russian submarine with a deadly passenger, chase terrifying ghosts, and come face to face with an army of upgraded Cybermen, while The Doctor’s oldest secret threatens to be revealed. 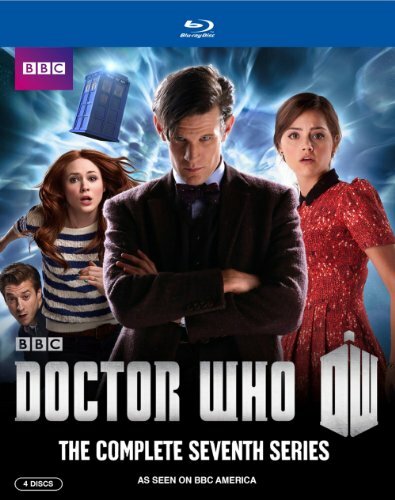 Packed with extras, the complete seventh series is not to be missed.